The WCT 5513 is custom made for Howard Marx of Westcoastime by the Swiss manufacturer Ollech & Wajs. It's a diver's watch with an automatic movement and a design heavily borrowed from the famous Rolex Submariner. The 5513 uses the ever-popular 2824-2 ETA, which features manual winding and hacking. It beats 8Hz, which makes the second hand sweep very smoothly compared to other low-price watches, such as Invicta and Seiko. The watch does not have a date window, but the movement is a date movement. When pulling out the crown, the date position is obvious, and when turning it, you can feel the date mechanics working. This affects the watch in no way, however. The case is stainless steel. The sides and back are highly polished, but the front has more of a fine-brushed appearance. A standard watch tool can be used to remove the back. The crystal is mineral, and therefore subject to scratching much more readily than sapphire. Its flatness can also be problematic for glare. The crown is generic and unmarked. A "W" or something similar would have been nice touch to give the watch a bit more identity. The crown is also stubbier than that of the Rolex or Invicta, but this doesn't impede its operation in any way. It screw-down movement works smoothly and there doesn't appear to be any danger of cross-threading. The bezel is unfortunate. It has a one-way ratcheting movement that has some play to it and doesn't quite line up with the tick marks on the dial. The luminous circle in the middle of the index triangle is slightly uncentered, to the extent that it cuts through the edge of the triangle. Even though Westcoastime describes this watch as a beater, I don't believe this to be an excuse for poor quality control. I quickly contacted Howard Marx about the bezel and he assured me that I could send it back and it would be swapped out for one that was better. I elected not to go this route, however. The associated shipping charges weren't worth it to me--I notice the misalignment only when specifically looking carefully at it. The knurling on the bezel is lacking, making it difficult to twist. When comparing it with a Rolex, the Rolex has deeper cut edges that extend further down the side, providing a good texture to grasp firmly. The 5513 deviates from its Rolex-like appearance by way of its sword-shaped hands. I personally prefer these over the Rolex style. The second hand has an arrow on the end and correctly overlaps the second/minute markers around the dial. The artwork on the dial is clear, uncluttered, and handsome with its use of white and dark red. The hour marks are large and instantly visible. Because there is no date window and accompanying cyclops magnifier, the watch has a very balanced and pleasing look to it. Below the 12-hour mark are the words WCT PRECISION, and above the 6-hour mark are the words PROFESSIONAL 200m/660ft AUTOMATIC. Below the six hour mark appears the words SWISS MADE. Beside each hour mark is a red number that represents 24 hour military time. 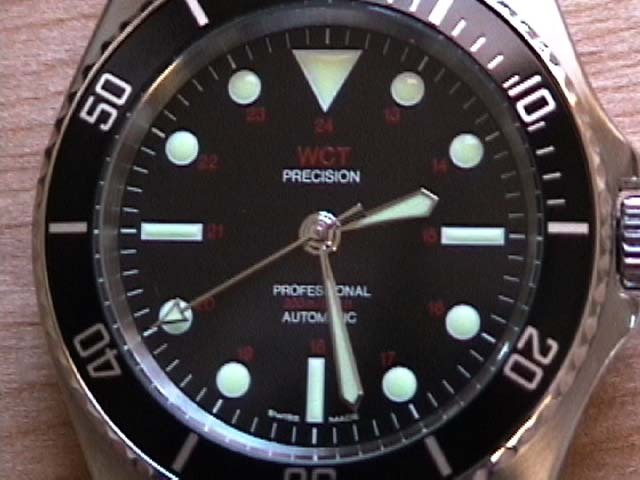 Tritium paint, a rarity nowadays, is used on the dial and hands. It glows strong all night long and can be used in a movie theater without any difficulty. Oddly, even though tritium is used, no mention of it is made on the dial. I do have one minor concern regarding the tritium in the bezel. While the dial and hands are nicely behind the crystal, there is no such barrier with the bezel. I can only assume that radiation is spewing out from it. As radiation goes, however, it's pretty tame--supposedly it just bounces off of skin. A mild and probably misplaced concern. Over the course of three days, the watch has gained eight seconds, which is more than acceptable for the movement. The watch comes from Westcoastime with either a stainless steel band, complete with diver's extension, or a NATO band. I elected to get both. Aside from the novelty of the diver's extension, the stainless steel strap is typical fare for the various Submariner look-alikes on the market, offering construction that's on-par with an Invicta. I prefer the watch on the black NATO strap, which is a real NATO strap with heat-welds rather than a cheap immitation that uses stitching. The black strap really compliments the watch itself and somehow manages to boost its elegance. The downside of the NATO strap is it takes more time to put it on and take it off. No user manual accompanies the watch, nor is one really necessary. If you've ever touched a watch in your life (aside from a digital one), you know how it works. 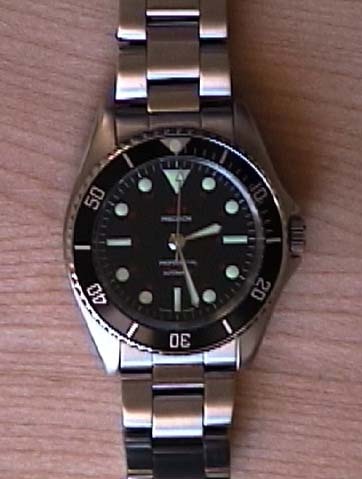 The only thing that might not be so obvious to those who have never had a diver's watch before is the screw-down crown. Packaging consists of a generic watch box that has a Westcoastime business card as an insert. Not flashy, but satisfactory, and in truth, a surprise; I wasn't expecting to receive a box at all. Being slightly thinner and narrower than a Rolex and not weighing as much, the 5513 is a pleasure to wear. It's easy to forget it's on your wrist. With some watches, there is the problem with the crown poking into one's wrist while bending their hand backwards. This has not been an issue with this watch. Some of this is due to the smaller crown, and some of it is due to the height of the case back. There are three improvements I would make to the watch. Sapphire crystal is one of them. The way I see it is that a watch described as a beater should be able to take a bit of a beating. Whether or not this is practical for a reasonable price, I don't know. I would also add a bit more style to the watch and have a signed crown. It's one of those small things that goes a long way. Finally, quality control. The bezel should have been instantly placed into the reject box the moment it rolled off the assembly line, and certainly should have never been mounted on a watch. For the $237 that I paid, the watch is an exceptional value, even with the cosmetic and mechanical issues of the bezel. Its clean, attractive, design and quality Swiss construction makes it a real winner. Overall Score: 8/10 with points lost for the crystal, bezel, and crown.